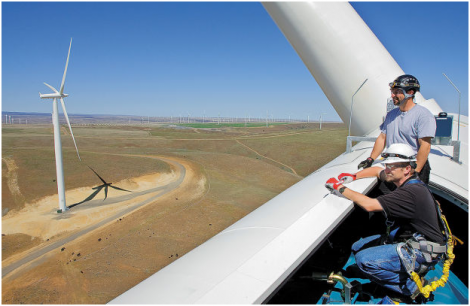 Lewis County PUD receives about 6 average megawatts of power through its 10% share of the White Creek Wind Project, located in Klickitat County, Washington (Our Capacity Share is 20 MW). The project has 89 turbines with a nameplate capacity of 204 megawatts. The project is co-owned by Cowlitz PUD, Klickitat PUD, Lakeview Light & Power and Tanner Electric Cooperative, and produces an average of 68 megawatts of power. While at the current time we have a purchase power agreement to purchase a share of the wind from White Creek each hour, we do have an option to take an equity position in the wind farm in 2027. White Creek is located on 9,500 acres of ranch land 21 miles East of Goldendale, just northwest of Roosevelt, WA. Construction began in 2006 on roads, transmission lines, and other infrastructure. Wind towers themselves were delivered and installed between June and September of 2007. All 80 turbines were commissioned and spinning in November 2007. White Creek is located in the Columbia River Gorge, on 9,500 acres of ranch land, 21 miles east of Goldendale which is across the Columbia River from Arlington, OR. Siemens Power Generation supplied, installed and commissioned the 89, 2.3-MW wind turbines and associated towers and other equipment at the project. Based on a one-third capacity factor the projected annual output is 68 average MW. Powers an estimated 38,000 residents or about 427 residences per wind turbine. We have a 10% off-taker agreement, pay 10% of the O&M costs, and in return receives 10% of the power and 10% of the associated RECs. We can expect roughly 52,800 RECs per year from the project that can be used toward the I-937 requirement. Construction began in July 2006 on roads, electric transmission lines, two substations and other infrastructure. Wind towers, blades and other related equipment were delivered from June to September 2007.